About five months ago I started to have pain in my right knee and the only thing I could faintly remember that could have caused the sudden pain was twisting it one evening during bath time with the girls, nothing drastic and nothing overly physical. It was a busy time at work and at home and I knew that there’d be no easy diagnosis; so, Advil, elevation and ice (when I remembered) were what I hoped were the quick fixes. Mid-December I finally saw an orthopaedic surgeon at the practice that treated me when I broke my arm in 2009; three office visits and an MRI later that I learned a cyst had formed on my knee joint and was causing the pain and swelling. Synovial chondromatosis was the official diagnosis and the first course of treatment included a steroid injection, a compression sleeve (for high impact activity), ice, elevation, and four weeks of physical therapy. So, arthroscopic surgery it was. In early February I went under the knife for the second time in my life. Luckily this time I didn’t wake up to learn I had cancer. Whew. (Kidding … sort of) They were able to remove the cyst and the inflamed lining of my knee joint in about 30 minutes. The recovery process was fairly quick, I was back doing most normal activities within a week and felt much better than before the surgery, but still had swelling and some pain. Physical therapy helped me to regain strength I’d lost, but at a post-op visit my surgeon noted that the synovium (joint lining) was extremely red and inflamed; more so that he’d ever seen in a patient without an underlying tear or dislocation. The cyst he removed was about 1 cm in diameter, there’s no rhyme of reason to why it formed, and I’m now at risk for future cyst formations. In the meantime a synovial biopsy and follow-up blood work revealed that I have the early stages of rheumatoid arthritis (RA). But, I’m not even 35?!?! What the what? I’m almost eight- weeks post-op and still having aches and pains in my bad knee, and still have some physical limitations. I have swelling in both knees, more pronounced in my right knee and blood tests lean toward a full-blown RA diagnosis. I’m on a high-dose pain reliever and anti-inflammatory twice a day that’s helping very little and still has me hobbling at times and awake with aches and pain in the middle of the night. Enter all the talk of gluten free diets. And how it seems like a bunch of hooey and another fad diet to me. Until I talk to a neighbor that has been gluten-free since last June and started the diet as a means to see if it would help with swelling she had in her foot, a running injury. And, it did, and she feels great! She doesn’t have celiac disease, but clearly has some level of gluten intolerance. I spent a few days reading up on joint swelling and going gluten free and have read countless stories of people that found relief by giving up wheat. And to boot they have more energy, have lost weight, and ditched prescription medication, not to mention the digestive benefits. So, I’m giving it a try. If giving up a few things on my plate means that I’m able to more naturally get back to my more active self, then I’m game. If it means there’s a chance I can ditch the prescription medicines, count me in. As I sat in the rheumatologist’s office during my first appointment, I read in Arthritis Today (yes, this is a real magazine, and yes, I was reading it), that losing one pound of body weight takes the equivalent of four pounds of pressure off your knee joints. This gave me the swift kick in the rear that I needed to truly focus on losing those last 10-20 pounds that have been hanging around the last few years. Imagine lifting 40-80 pounds of pressure off your joints just by eating better and exercising regularly?! I’m taking it a day and a food at a time, adjusting our meal plans to accommodate some newer foods and some healthier options. Lucky for me, I know several people going down this diet-road and because it’s a popular diet there are a ton of options at the grocery store down the street, no specialty store needed. Sure I’ll miss bread and pizza crust, but it’s a very small price to pay for my health. And, if I see results after a month, there’s nothing to say that I can’t cheat here and there. I’m a Kentucky girl, after all, I’ll HAVE to have my fried chicken from time to time. My goal is to regain full use of my knee, including the ability to run. Charlotte is weaned and I'm ready to hit the open road! I’ll keep you posted on my progress and any good gluten free recipes I come across. In the meantime, wish me luck ... and enjoy a piece of bread for me. CUPCAKES! Yes, not the traditional next line, but that's what Anna and her cousin, Aiden, were most excited about at Charlotte's birthday party. After running up the stairs, sliding down, bopping balloons, checking out Charlotte's new toys, they were ready to refuel with pure sugar. So much energy! At this point they were chanting "cupcakes, cupcakes, cupcakes!!!!!" Well, it finally happened, I missed a monthly letter. I knew I couldn’t keep it up forever and I kept trying to make time, but life just got in the way. And that’s OK, because a life full of hugs and laughter from you is so much more important than sitting at a computer. That said, my brain cells are dying faster and faster and I love being able to look back and read about what you were doing just a few months ago or last year or during those precious first few months of life. We are in full blown princess mode around here. You have several princess skirts that rotate, an amulet necklace (just like Sophia’s), and so.many.tiaras. If we’d allow it, you’d wear a princess skirt 24/7, but we have to draw the line with school and public outings, so it’s the first thing you run to get when we get home. Your dress-up clothing is in a bin within reach in your room and you’re now independent enough that you can walk up, dress-up and return before we even knew you were gone. When we’re going to be home for a while, we let you wear your princess dress, which is basically a full blown ball gown, and although you look adorable, the taffeta is scratchy and it’s hard to find an easy way for you to use the bathroom … but none of that bothers you. When wearing a princess skirt, you demand we “introduce” you as Princess Anna (“do do do do, it’s Princess Anna”) and when you’re wearing your dress you are “Anna-rella.” You call your father Prince Daddy, I’m Queen Mommy and Charlotte is still just baby Charlotte. You love to “go to the ball” and dance and will hold your hand out to Prince Daddy and ask him “may I have this dance,” and then the two of you twirl you around the room. You love to put on a show and are turning into quite the performer. You can sing, dance and act, quite the triple threat! You love to re-enact scenes from your favorite shows (namely Sophia the First) and are generally pretty spot-on. When a performance is complete, we are given the OK to clap and you look adorable as you stand there and bow or curtsey. You take a weekly dance class at school and I was able to observe a class last month; I must say you were the cutest student. The class focuses on a mix of ballet, gymnastics / tumbling, and dance moves and you participate with two of your best friends, Audrey and Avery. You love to show us what you learned on Wednesday evenings, and although we opted not to participate in the recital this year, I can’t wait to see you perform on a stage one day soon. We've started to see some sibling rivalry here and there and were extra cautious during Charlotte’s birthday celebrations a few weeks ago. Now that you can process and understand more of what is going on around you, we’re careful to make sure you feel included, but also understand what’s really going on. We started talking about how Charlotte’s birthday was coming up and that yours would be next and were mindful to get you a few gifts to open (one from Charlotte specifically), adorned your chair with balloons and also bought you a special cupcake. The day of the party you did great and were a “big helper” when it came to opening gifts, and then testing them out. You’ve already told me that you want a princess party with pink cupcakes, so I’d better get to work. You are still a very sensitive girl and tend to get your feelings hurt fairly often. It’s hard for your Dad to understand why something makes you sad or upset sometimes, but he’ll get there; he’s living with three girls now, after all. Sometimes you just need an extra hug as you leave for school, or an extra kiss goodnight, or for Mommy to linger in your room for just a minute longer. You give the best hugs (in the whole wide world, as your Gigi tells you, and you repeat) and nothing is sweeter than when you come over unprompted, wrap those little arms around my neck and say “I love you so much, Mommy.” I read somewhere recently that you should never pull away first when hugging a child because you don’t know how badly they may need that hug and I do just that; I let you linger as long as you need. There will come a day when you won’t want to hug me in public, or maybe even at all, but I’ll tell you that to this day, the best hugs I get are from my Mom, there’s just nothing in the world like them. When I’m sick it makes me start to feel better, when I’m nervous or anxious it puts me at ease, and it always makes me smile, just like hugs from you. You will always be my little princess, twirling around, asking your Daddy for a dance. And I’ll always be here to give you a hug when life’s not exactly a ball. Pretty in pink: celebrating the birthday girl! Charlotte had a wonderful time celebrating with family during her birthday party last weekend! If you know me, you know I love birthdays, so of course we didn't just celebrate that day, we had balloons and cupcakes on her actual birthday and thanks to helium and wildflowers, we've continued to celebrate well into the next week! And now, for our final installment ... from newborn, to infant, to toddler, it's been a year of some serious growin' around here! 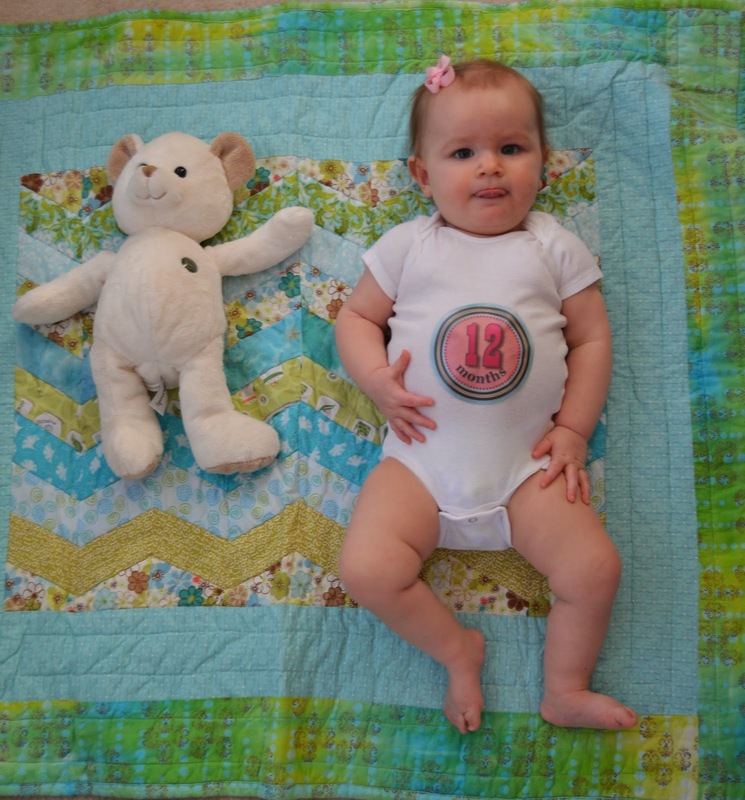 Charlotte's final stats at 12 months were 18 lbs 9 oz (10th%) (and a slight loss from 1 1/2 weeks earlier due to some yucky bugs), and 28 inches (10th%). She gained 12 lbs exactly and grew 8 1/4 inches over the course of the year - way to go Charlotte!! 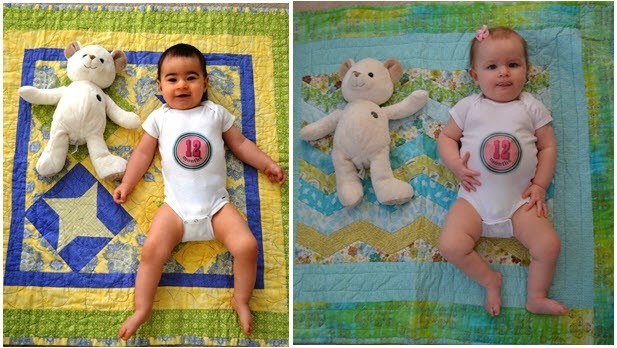 We used her pictures to create a banner at her first birthday and I still can't believe how much one human can physically change over the course of a year! 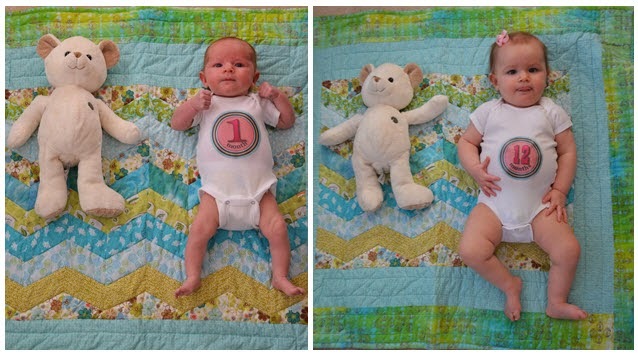 Month one and month twelve! Miss Charlotte ended the year weighing 5 ounces more and was 1/2 in shorter than Anna at the same age, uncanny how they can look so different, but be so similar! Wow, where did a year go? It seems like just yesterday we were (finally) welcoming you to our world. I remember those first few hours, staring down at your little face, your little hands, your little toes, feeling you pee on me (twice! ), and looking at your fair skin and strawberry blonde hair. I was certain that all of my children would have your father’s dominant dark hair and eyes and was amazed when you were placed on my chest for the first time. It was love at first sight and my heart has grown to exponential proportions over the past twelve months. You turn one year old today and to celebrate I've taken the day off work and you’re staying home, just Mommy and Charlotte and all of your favorite things: snuggles, playing, a trip to get your first pair of walking shoes, lunch out, and napping. I love spending time with you one on one and watching the wonder in your eyes, the excitement as you find a new toy, or an old toy you haven’t played with in a while, it’s adorable to see your speed-crawl over to the cats and start up a conversation or to watch you proudly point at something you've done. It will always be a miracle to me how babies go from tiny immobile babies to fast-paced toddlers in just a year, but you’ve done just that, and all the while with a huge grin on your face. You’re one of the sweetest little girls I know and truly look at the world as your adventure zone. You are crawling everywhere, and getting there fast! You’re pulling up and can coast along the couch or the coffee table, but aren’t walking on your own just yet. When your sister reprieves, you love walking behind your “dino” and can really move behind your trusty green friend. Your sister didn’t walk until around 14 months and I’m thinking you’ll follow suit, which is fine by me because I’m not sure what our world will be like with two totally mobile kids in the house. You love to wave, can tell us “all done” in sign language, love to raise your arms high above your head when we ask “how big is Charlotte? ?,” and you try to imitate just about anything we do. You’re an excellent eater and I’m cherishing this time when foods are new and exciting versus your sister who is currently on a strict mac n cheese and PBJ diet. We’re pretty much at the point where you are eating three meals a day and snacks with no purees and you’ve started working on using a sippy cup at school this past week. You’re doing pretty well and we’ll work on weaning to whole milk and constant sippy cup use over time. I’ve nursed you morning and night and have made it to my goal of a year, sure we had some bumps in the road, and I didn’t always have the strongest supply, but I took solace in knowing that you looked to me first as your source of food and comfort. I haven’t slept away from you since you were born and have nursed you all but one morning during your first year of life; I can count on a couple of hands how many times someone else has put you to bed, and I must admit that I’m going to miss that special time together. It’s not to say that we won’t still get to cuddle, or that I won’t still rock you to sleep, it will just be different, another new phase in both our lives. Speaking of sleep, you’re still a rockstar, only waking up if you need something; unfortunately that happened quite often over the past two weeks. A combination of new teeth and a yucky virus, and an ear infection had you down and out for a few days. Luckily antibiotics (your first round ever) and rest got you back to your regular, happy self in a few days. Generally you’re down for the night by 7:30pm and are a pretty sound sleeper. We can count on hearing you talking to yourself or randomly crying out at least once a night and it’s not uncommon to hear you starting to chitter-chatter to your stuffed animal friends between 6:30 and 7am, but you rarely cry and are content to hang out in your crib until we come to get you. You continue to be enamoured with your big sister and seek her out any chance you get. Your adoration isn’t always returned immediately, but Anna loves you more than anything else in this world. You’re in a hair pulling phase right now and tend to get a little hands-y if not restrained, but I’m hopeful this phase will work itself out in a bit. You love playing with toys and puzzles and love, love, love to read books. There are three touch-and-feel books that were Anna’s that you particularly love to “read.” You’ll seek them out and will sit by yourself flipping the pages for quite a while. With your new love of pulling up, you also love to spend time “cooking” at the kitchen playset. Sometimes it’s less cooking and more pulling yourself up and down, but it’s adorable to watch. Size-wise you’re a little heavier and a little shorter (not by much on either) than Anna was around this time, but just as cute. It’s been fun seeing you fit into some of your sister’s old outfits, but because of the every-so-slight difference in seasons we’ve had to buy you new jammies and several new outfits to last you through the end of winter (which may NEVER end, it seems). No matter what you wear, you look adorable. I’ve talked to you about your sweet and gentle personality a lot this year, and it’s not because I don’t have anything else to say, it’s because that’s what I think of when I think of you. My sweet, sweet Charlotte. The little girl that gives the biggest grins, the best hugs, the cutest open-mouth kisses, and literally makes every day so much brighter for everyone she’s around. You have an aura about you that just makes people smile and you delight in the smallest things in life. There’s a book and a saying all about not sweating the small stuff and there’s some merit to that mantra … but not in your world. You truly delight in the small stuff and it brings a sunny perspective to each day. Each tickle of your belly, Anna doing a silly dance, a game with Daddy, one of the cats coming over to play. You have made my world so much more complete than I ever thought possible. You will always be my baby, my little girl, I will always seek out your hugs, delight in your laughter and smile when I think of the memories of your crazy fun first year of life. Please don’t ever forget that my shoulder is always yours to cry on, my ears are always open, and I’ll support you through whatever life throws at you; I know that one day you’re going to change the world – after all, you’ve already changed mine.